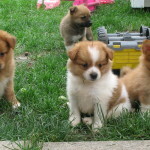 Pomeranian X Puppies For Sale Sorry, we have not had Pomeranian puppies for sale or Pomeranian X puppies since 2013. 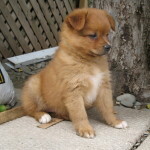 At CuriousPuppies we have had the privilege of experiencing several different types of Pomeranian cross breeds, as well as the purebred Pomeranian. 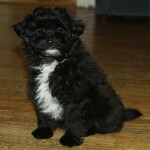 We have had Pomeranian x toy poodle puppies for sale (pom poo), Pomeranian x chihuahua puppies (Pom chi), and Pomeranian x shih tzu (Pom Zu). Each one with different looks and different personalities, but all very cute! 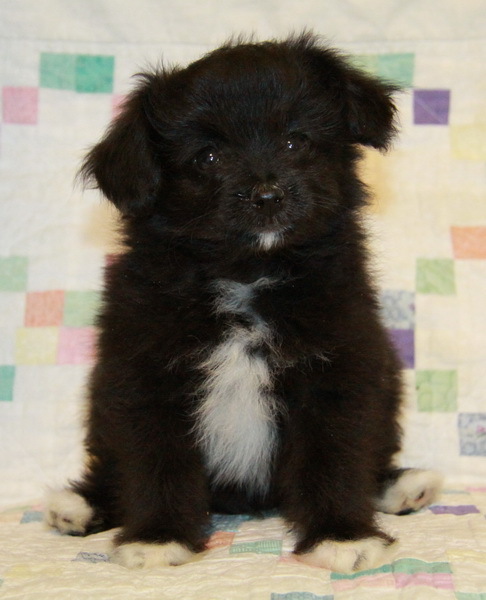 When it comes to Pomeranian x puppies for sale, their individual looks and personalities will vary greatly. 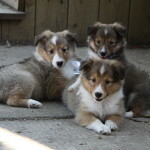 Their size and colouring will depend on the breed they are mixed with. 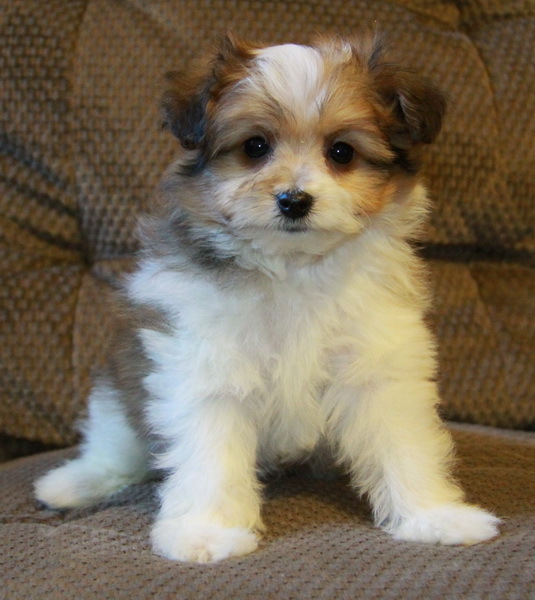 Pomeranians tend to be under 10lbs as purebreds. 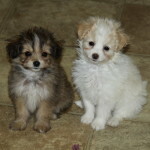 And the poodle can be toy or mini (usually toy) when crossed with a Pomeranian. 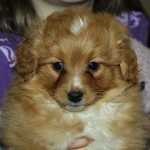 This will affect the weight and height of the Pom x puppy. Chihuahuas are most often under 10lbs, but can also be up to about 15lbs. 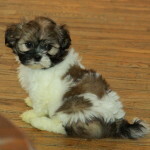 Shih tzus are mostly under 15lbs as well. 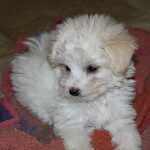 Due to the variety of colours the poodle offers, our Pom poo puppies have been everywhere from all black, black/white, red, red/white, blond, cream, and tri-coloured. And they are all beautiful! 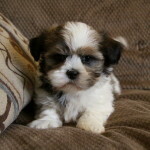 Shih tzus also offer quite the variation of colouring, so their resulting puppies can have quite the dramatic differences in colouring, even within one litter. 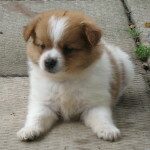 On top of colouring and size differences, the Pomeranian crosses can also have different types of hair. For example, when crossed with a chihuahua, the resulting hair can be everywhere from smooth, some fluff, to full out poofy! 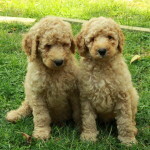 And they can be quite curly when crossed with the poodle, depending on how much they take after the poodle parent. Pomeranians are not hypoallergenic or non-shedding dogs, though they don’t tend to cause too much allergy related trouble. 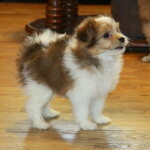 The purebred Pomeranian will “blow its coat” twice per year, which will result in a load of hair clean up each time! 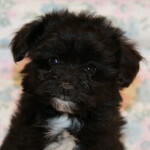 However, when crossed with a poodle or shih tzu, they are less likely to have this “blowing” at all. This also makes them more allergy friendly if allergies are an issue. 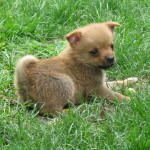 The Pom chi however will not be a hypoallegenic dog, as the chihuahua is not allergy friendly and does have shedding. If the coat is more like the Pomeranian, there is likely to be less daily shedding however, so this can be good for less clean up. 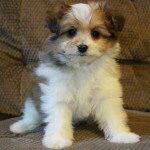 Overall, they are not crossbreeds with much shedding, although they will require daily grooming to keep the hair looking nice and free of matting. Frequent hair clips will be necessary as well, depending on the type of hair resulting from the cross. Just as the Pomeranian crosses can have different looks, their personalities can be quite varied as well. 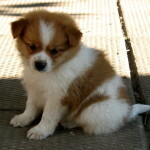 Most purebred Pomeranians can be quite yappy and fairly stubborn, though so adorable! They have the ‘big dog’ complex and tend to think they are bigger than they are – thus wanting to dominate or be alpha over much larger dogs! This can be funny to watch, but it is always important to keep an eye on them around bigger dogs, because they still are quite small and fragile! 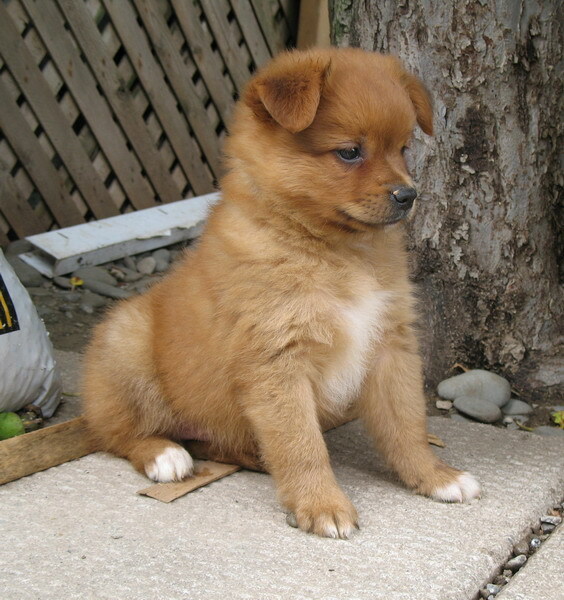 Many Pomeranians that are crosses tend to be less yappy by nature, and when trained are not as excessively barky. 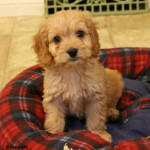 They are also more intelligent when crossed with the poodle, due to the poodles’ high level of intelligence. They also have such a friendly and fun personality and can be quite good with children, as long as they are properly supervised for safety. 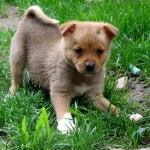 The cross of the Pomeranian and the chihuahua can still have that small dog syndrome, as well as the yappy nature however. This can always be trained out of them if you wish, or if you want some form of warning when someone is at the door, then this is a dog for you! 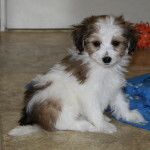 All puppies should have basic command and behaviour training, and this is when you would learn the basic commands for helping your new puppy fit into your home. 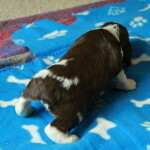 All new puppies will need to adjust to their new homes. 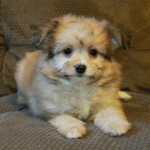 When it comes to Pomeranian crosses, it is best to be prepared ahead of time with basic supplies such as a small crate for crate training, pee pads or newspaper if you wish to pee pad train your new puppy, food and water dishes, food, basic toys such as ropes, hard toys, balls and easy clean blankets. 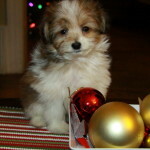 Your new puppy will be teething for the first few weeks and will need a lot he can chew on to help with the process. It is also recommended to have a small paper towel supply for the occasional accident, and a bottle of vinegar and water mixed can be used to safely clean the floor. If you wish to use treats for encouraging positive behaviour with your new puppy, it is a good idea to pick those up ahead of time as well. 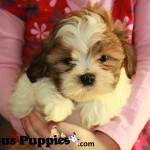 You will definitely need a small treat size as they will be tiny puppies! 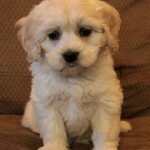 You don’t want tiny puppies to choke on something or have it get stuck in their throat. 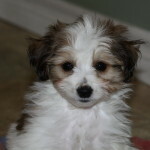 Another recommendation in place of treats is to offer them their kibble bits outside of regular meal times. Trust us, they think of that like a treat as well! We do advise not to over-feed treats to new puppies as it is common that they will prefer the treat over their usual food. This can cause a problem if they begin to refuse their normal meals and they only want to eat ‘candy’! The best time to offer treats is either once a day before bed time to encourage positive reinforcement of using their crate, and for trick or other training after they have been with you for a few weeks to a month. 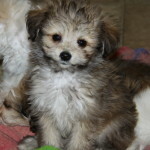 Overall, when it comes to Pomeranian crosses, make sure it is a well thought out decision ahead of time, and be prepared to bring home your new puppy. 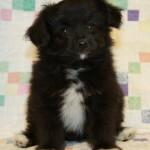 A Pomeranian cross puppy is likely to be a heart-stealer-be prepared to fall in love!